See Cretaceous sponges from the Campanian of Misburg and Höver for other sponges from this family. Mushroom like with a broad upper surface on a short stalk. Surface covered with load radiating folds. 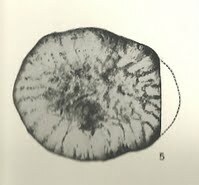 Disk is about 33 mm in diameter and the height of the sponge is about 20 mm.